We usually put a lot of time and effort into creating great sales pitches to seduce new customers and sending sophisticated emails full of jokes to keep their attention and increase their loyalty. Then we contact them through email marketing, which we know is the best way to stay in touch with your customers. Sometimes, we forget about one important thing – the moment when a customer has enough of your emails and looks for an unsubscribe option. The button we don’t want them to click. So how about a little fight to prevent them from unsubscribing? You can use another chance to keep subscribers, by letting them change their email preferences and seduce them again. To do it, you have to show your personality, make your customers laugh and tell them how much you care about them staying. Let me show you the most popular reasons people want to unsubscribe from email lists and how you can prevent it. Sometimes the reason people want to unsubscribe is irrelevant content they get. Let’s be honest, there are tons of users who subscribe to your page because they like one of the blog posts, or because you simply offered a deal – but required them to join your newsletter first. It’s a natural thing that after a while, people notice that the content they get is not their particular interest. But that doesn’t mean they need to unsubscribe from your page immediately. Since they were on your page before, some parts of the content might interest them. You just need to give them a possibility of choosing one. Take a look at the example from Grammarly. You can immediately feel that this is the company that spreads love all around. Are you still sure you want to leave them? You can decide what type of content you want to receive. 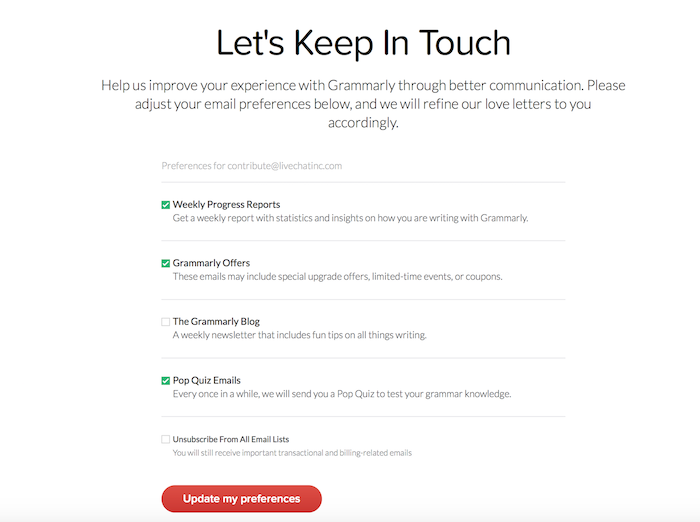 Surprisingly, our content team wasn’t subscribed to the Grammarly Blog, the main thing of our interests. But now I have a chance to fix this. Additionally, under all the options we have there is choice to unsubscribe from all the email lists, but we’ll still receive important transaction and billing–related emails. Another reason people might want to unsubscribe is that they’re getting too many emails. Simple, yet clever ideas which make me in love with their content writer. They fight for a customer in a cute way, that reminds us of a real relationship. 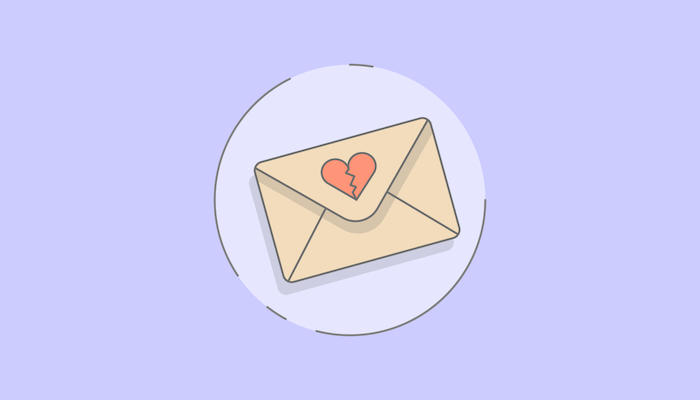 The unsubscribe button is like a breakup trigger for many companies with customer–centric culture. That’s why they use all the emotions they can to stop customers from doing it. They bring back the good times a customer shared with them. Nice trick, don’t you think? Luckily, customers want to unsubscribe sometimes just because they changed their email address. 1-800 contacts, a company that sells contact lenses, knows how to make the good use of it. What a relief! For both sides, I assume. 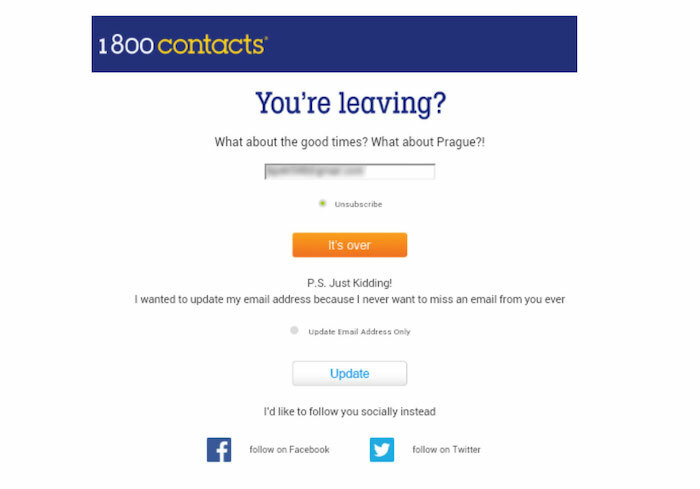 As you see, 1–800 Contacts don’t give up easily. If you really want to unsubscribe from their email list, they give you an option of following you on social media so they can stay in touch with you. Nice one! Recently, I had one of those days, when I thought – “why do I get so many emails, who is this anyway? I’m gonna unsubscribe, it’s just a waste of time.” I wanted to unsubscribe from some of Polish company’s email list and I saw the option of snoozing notifications, so I chose one. Why? Because I wasn’t sure if I wanted to cancel my subscription entirely, or it was just that I had one of those days when emails bothered me. I decided to give myself a choice of coming back, which means getting emails again after a while. We all know a break is all we need sometimes. It’s a really great option in case of e–commerce stores which have their high seasons like Holiday Shopping Season or a summer sale when they send much more emails. When you want to stand out from the crowd, you can create a video with the speech to a customer who wants to unsubscribe, just like Hubspot did. Check out a video from Dan Sally, Inbound Marketing Specialist. “Do you really want to break my heart?” He seems asking. You can clearly see his pain, and what the phrases he use – that’s what we call a personal touch. When I was writing this post, I noticed that our option of changing email preferences is not personal at all, so I changed it a bit. In each email you get from us, in the footer, you can change your email preferences, or unsubscribe immediately (which obviously you don’t wanna do, right?). Here’s how it looks now. To sum it up, here’s what you need to do when it comes to improving your unsubscribe email message. Don’t leave it up to chance, don’t lose readers, stop with the boring messages. I know that when people want to leave, you should let them, but there’s nothing wrong with a little fight for those you care about. Give it a try and who knows, maybe your subscribers will change their mind and give you one last chance.